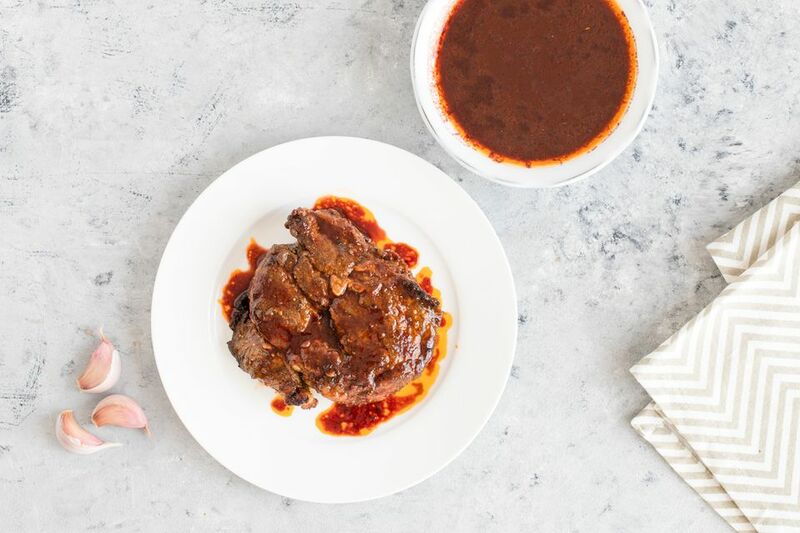 A red wine sauce is a simple reduction, and it is an excellent sauce to serve with lamb, steaks, roast beef, or duck. If you are making a pan sauce after roasting beef or lamb or searing a steak, use the same pan for the sauce. Use a good quality red wine, one you enjoy drinking, for this sauce. A cheap or low-quality wine could produce a rather bitter sauce. In a saucepan or the pan in which meat was seared, melt 1 tablespoon of butter. Place the remaining 3 tablespoons of butter in the refrigerator until you need them. Sauté the shallots until tender - about 4 to 5 minutes. Add the garlic and sauté for about 1 minute longer. Add the oregano and tomato paste. Cook, stirring, for 1 minute. Add the wine and bring to a boil. Reduce heat to medium-low and simmer, stirring occasionally, until reduced by about half and thickened - about 8 to 10 minutes. Place a fine mesh strainer over a bowl and strain the sauce. Discard the solids. Return the sauce to the pan over low heat. Cut the remaining 3 tablespoons of cold butter into small pieces. Whisk the butter pieces into the sauce a few at a time. Use this sauce with grilled or broiled steaks or roasted pork or beef.